It’s a Bird, It’s a Plane, It’s a Giant Slug? Just south of Big Sur on California Highway 1, we hit the brakes when something akin to a 15-foot long slug caught our attention. Born and raised not far from the Pacific Ocean, I never saw such a creature on any California beach. It was 1997, my husband and I had been living in Santa Fe for nine years, and we were on vacation in California. There were few legal places to pull our rental car off the highway, so we broke some likely vehicle code and parked as close as possible to this giant slug sunning on the beach. As we neared the beast we heard from the crashing shoreline something that sounded like a Harley Davidson revving its motor inside an empty warehouse. “Did we just enter the twilight zone?” I asked my husband. We paced through the ranchland grasses west toward the beach. Eerie noises seeped between the fog and sand, and more slug-like creatures appeared. “What are they?” we simultaneously questioned each other. A kindly man sauntered up and asked, “I betcha you want to know what these creature are?” He explained that they were not slugs, but one of nature’s most amazing—and noisy—marine mammals, the northern elephant seal. He was a Friends of the Elephant Seal docent. We tested the docent’s knowledge and fueled ours. As the sun neared the ocean’s horizon, we departed, and were amazed at this recent continental beach arrival by marine mammals that were, by the late 1880s, hunted to near-extinction. Today, I’m one of those kindly docents one would find—in a much more developed viewing site—for the northern elephant seal rookery at Piedras Blancas, on the central California coastline. Once these 1000 to 5000-pound mammals took up seasonal residence here, thousands of curious folks mimicked our steps. Now there is a parking lot, and the State of California purchased the strip of ranchland from the Hearst Corporation. The handicapped have access, and the elephant seals are protected from us. Visitors test my elephant seal knowledge. Most visitors think I’m a genius, but the truth is, I just repeatedly answer the same thing all day long. “What are these things?” “Are these walruses?” “Why do they make that funny noise?” and so on. However, I do have stump-the-docent moments. The boardwalk along the bluffs hosts hundreds of visitors daily while elephant seal cows give birth, nurse their pups, and the two-ton alpha bulls claim their harems for the breeding fest that reaches its pinnacle on Valentine’s Day. When visitors ask what their predators are, I mention that we were their worst nightmare, and that they battle great white sharks and orcas. 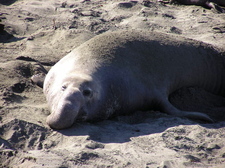 There are more than elephant seals at Piedras Blancas. Watch for harbor seals, California sea lions, and other rarely seen pinnipeds. Plus you may see otters, gray whales, humpback whales, dolphins, and dozens of birds—all of whom enjoy the sanctity of the Monterey Bay Marine Sanctuary. Author, Charmaine Coimbra's work has appeared in The Los Angeles Times, The Sacramento Bee, Ford Times, Women's World and more. In 1988 she and her husband, Clif Coimbra, purchased a Santa Fe childrens' bookstore. After selling the store in 1994, she wrote her first work of fiction, The Gathering Basket. Presently, Charmaine spends her time between Santa Fe and Cambria, Ca. She now authors and co-authors several blogs, www.CharmainesMusePallet.wordpress.com and www.neptune911.wordpress.com, while working on a memoir, We Were The California Girls.